Speaking about Ukrainian wedding fashion, I would like to tell that customs and traditions on the wed in Ukraine didn't changed from the old times. Especially it possibly to see in small Ukrainian cities and towns. Ukrainians has changed just one thing in wedding traditions, it is wear of bride and groom. Since beginning of 20 century, Ukrainian bride wearing a white dress and veil, like in almost all the world, and Ukrainian groom has a formal costume (black, grey or sometimes white). But until beginning of 20 century Ukrainian couples used to get married in traditional Ukrainian wear. 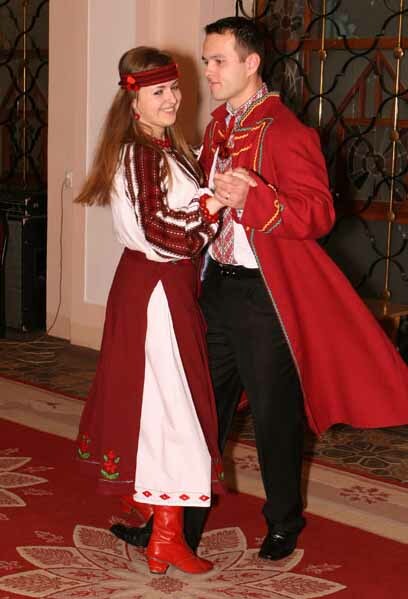 When Ukraine became independent in 1991, many young couples (especially in Western part of country) started to renew an old tradition to get married in Ukrainian wear. More than that, they used to ask their relatives and friends to wear Ukrainian traditional clothes to the weddings (or modern clothes, but with elements of Ukrainian embroidery). So, many of my West Ukrainian friends got married in Ukrainian embroidered wear, and my husband Ron and I decided to keep this "old new" fashion too. We were married in Western Ukraine in August, 2007 in Ukrainian clothes, and almost all the guests on our wedding were wearing in Ukrainian style too. But not our couple decided to keep this nice tradition. 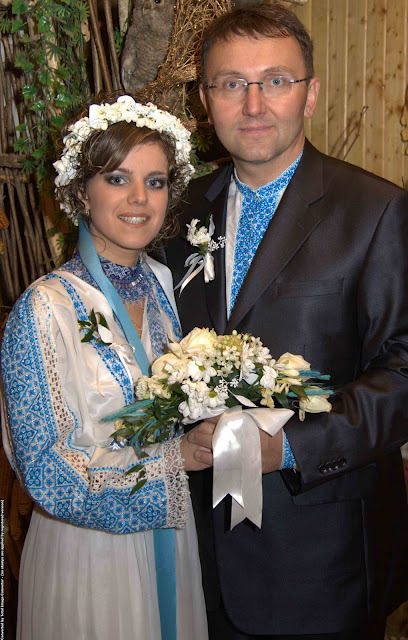 Still three couples from Ternopil city (Western Ukraine) got married in old Ukrainian style during 2007. I have a pleasure to introduce you Oksana and Svyatoslav, Natalia and Taras, Halyna and Mykhailo. All of them brought a new wedding fashion to the Ternopil community. This wedding fashion looks interesting. Very traditional. Interesting, is there are a lot of differences between people from Western Ukraine and Kiev ? I visited my girlfriend that i met on https://katedating.com and it's hard to find people in clothes like this on the Kiev street. Thanks for your comment and for your interest to Ukraine! The question is, traditional Ukrainian costume is not a street fashion, that's why you didn't see it worn casually. Ukrainians normally wear traditional style of clothes for celebrations, like, weddings, festivals etc. Good luck in your dating of Ukrainian lady!